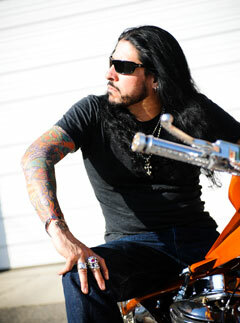 Xavier Muriel of hard rock band Buckcherry has heard all the drummer jokes. But he believes that he and his fellow beatmakers will have the last laugh. "If it weren't for the great drummers, you'd have no bands," he says. "Nobody dances to lyrics. Nobody dances to guitar riffs. They dance to drums!" Xavier knows all about making people move: He recently completed a 25-month tour supporting Buckcherry's latest album, 15. The reconfigured band features three new members--Xavier, guitarist Stevie D., and bassist Jimmy Ashhurst--alongside Buckcherry's founders, guitarist Keith Nelson and vocalist Josh Todd. It's rare to spend two solid years supporting a single album, but the effort paid off: 15 has been hailed as a crucial comeback for the group. But for Xavier, everything was new. "This is my first major band," he says. "It was great to finally tour on a bus and play the same venues where I grew up watching Motley, AC/DC, and Maiden." Xavier was a Buckcherry fan before joining the group. "I've known Keith Nelson for years," he explains. "He'd let my bands open for Buckcherry whenever they came through Austin, Texas, where I lived." When Xavier relocated to LA, Nelson let him stow his drums in the band's studio. The two began jamming, and before long Xavier was part of the reconstituted lineup. Buckcherry is finally off the road, but they're not resting. "We're writing like madmen for the next album, and demoing everything in our studio," says Xavier. "We like to get together in a room and come up with ideas by jamming. That's how we wrote 15." When some 14-year old kid asks me why I play Yamaha, I want to be honest with him, because I was that 14-year old kid! Thanks to that album's success, the group will have a bigger studio budget this time around, but Xavier isn't about to forget the lessons of the lean years. "When we made 15, I recorded twelve drum tracks in two days," he recalls. "I had to buckle down and focus on the tunes, instead of trying to do outlandish fills and so forth. We still want to keep things as organic as possible. I'd like to record the drums in a nice room in as few takes as possible." Another constant: Xavier's Yamaha drums. "I've liked Yamahas ever since I was a kid watching guys like Cozy Powell and Tommy Aldridge play them," he says. 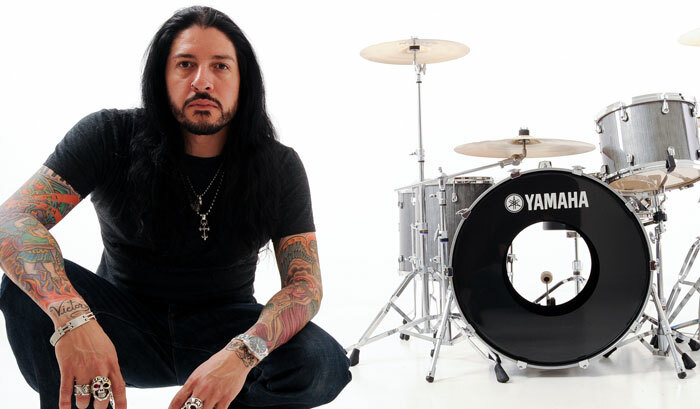 "To me Yamaha has always been the Lamborghini of drums. I bought a slate- blue Tour Custom kit in a drum shop and played it for over 15 years. I did a zillion shows with it and repainted it twice myself. Even after all those layers of clear-coat, they sounded incredible every time. So when I finally talked to Yamaha about an endorsement, I told them I didn't just want free stuff--I wanted to support a product I believed in. When some 14-year-old kid asks me why I play Yamaha, I want to be honest with him, because I was that 14-year-old kid!" Xavier pounded an Oak Custom kit throughout the lengthy 15 tour. "I beat the crap out of those drums for 25 months, and they were flawless. I also ordered a Birch Absolute kit with a 26" x 18" kick, which had to be custom-made. I like to use big drums live, though they can be overkill in the studio." That's just one of Xavier's new insights into the differences between live and studio drumming. "I'm not a huge technique guy," he confesses. "I'm a pretty bombastic player, all meat and potatoes. But now that I've had the opportunity to meet and talk with players like Josh Freese and Kenny Aronoff, I've realized that one of the reasons guys like them, Matt Chamberlain, Steve Gadd, and Russ Kunkel get gigs is because they understand the differences between live and studio playing. So now I'm trying to 'mix' myself a little more as I play. The snare and kick have to be really consistent. I may not hit the cymbals quite so hard. And there's a warmth you sometimes get by playing with less impact, as opposed to cavemanning it. I'm still not a 'technique' player, but I'm trying to learn those sorts of distinctions." In the meantime, Xavier and his bandmates plan to make the most of Buckcherry's rejuvenated career. "We're thankful to be doing this, and we're not taking any of it for granted," he says. "You can see when a band is just punching the clock. It's like being invited to dinner, and when you get there your hosts don't speak to each other--and worse, they don't even talk to you! But we are so ridiculously excited and grateful to be onstage, even if we've had a bad day or one of us is sick. Audiences see that--they feel it, and they give it back to us."